Adoption of rules establishing a funding structure for offshore wind renewable energy credits set the stage for New Jersey’s first offshore wind solicitation and established the market certainty needed for long-term investment in the industry, according to a Feb. 8 report by the New Jersey Board of Public Utilities, detailing the progress made towards the state’s 3.5 gigawatt goal. Democratic Governor Phil Murphy has asked the board to consider additional 1.2-megawatt solicitations in 2020 and 2022 as part of the 2030 target. The 1.1-gigawatt solicitation was issued less than a year since Gov. Murphy signed an executive order intended to jumpstart the stalled industry, and resulted in applications from experienced developers representing multi-billion dollar investments. The board’s decision on the solicitation will start the process of realizing offshore wind generation, advancing progress in supply chain development, private sector investment in ports, workforce training, and research. Discussions with other states, including New York, Delaware, Virginia, Maryland, Connecticut, Rhode Island, and Massachusetts, will help identify issues related to the integration of offshore projects into the onshore grid, as well as the development of shared ocean resources. The solicitation provides sufficient time for project developers to apply for federal tax credits, which represent about 12 percent of total project costs, and will result in ratepayer savings. 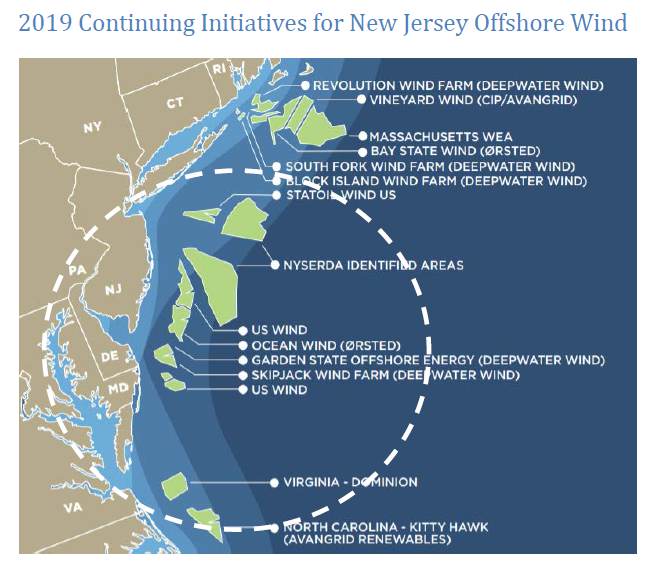 The New Jersey Economic Development Authority has opened applications for its offshore wind credit program to attract investment, and is is seeking information on the development of the offshore wind port infrastructure and supply chain.